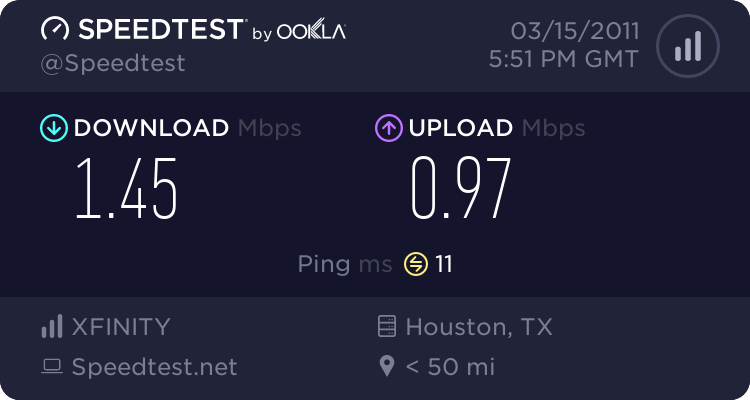 Houston TX Slow Dowload/Upload speed for what I pay for? I usually get almost the exact same results regardless of time and day. I feel like these DL and UL speeds are not even near what I should be getting. System is Win 7 64 bit and hooked directly to the modem provided bu Comcast. I pay for the Blast! service. Re: Is this a normal Dowload/Upload speef for what I pay for? The Blast service is rated at upload speeds up to 20mb/s download up to 4mb/s. So, start at the beginning, and look at the posts that are stickied at the top of this board. There are some initial troubleshooting tips that you can perform yourself to see if there are any obvious issues. If you get through all those, there is a post detailing the information you should collect and post so someone can try to help you further. I have had this modem for several years, ie probably between 5-10 yrs. Here is the traceroute info; working on some of the other steps. 6 15 ms 15 ms 16 ms te-0-0-0-4-cr01.dallas.tx.ibone.comcast.net [68. Re: Is this a normal Dowload/Upload speed for what I pay for? If I call customer service based on the speed test data and the logs I have, what would be the most appropriate way to discuss whether or not I am getting the speeds I am paying for (which is pretty obvious I am not)? Basically how do i go about getting Comcast to follow thru with giving me what I pay for? - Downstream Power level (should be between -10 and +10 dBmV). 10.3 is out of spec, but Comcast might not agree despite the fact that those specs were "officially" posted by a Comcast employee. Other Comcast employees think that between -15 and +15 dBmV is in spec. But, that's something you can discuss with them. Those stickys should be updated because to my knowledge the specs are now even tighter with upgraded to D3 systems of which all will eventually be. The forward (receive) power level is now preferred to be in the -7dB to +7dB range and the return (transmit) power level is preferred to be 40dB to 50 dB for systems that use 64QAM upstream modulation. The downstream SNR is now preferred to be at 36dB. Comcast has NO control over your download and upload speeds. They just provide the bandwidth. If you are downloading from a crappy server in Europe, where the file is located, of course your speeds will be horrible. Sometimes I can get a slow server and download slower then dial up. Its not comcasts fault. If you want try a known connection that is close by and fast. Go to microsoft or a major place and download from them. "Comcast has NO control over your download and upload speeds" Really? about 1.47 dl and .93 ul then it has nothing to do with comcast? I have run tests to servers located all over the country and get almost the exact same results regardless of location. Based on most of the constructive responses I have received, I am of the opinon that something is not right on Comcast's end, maybe the modem can't handle the dl/ul speeds, maybe something is off with the infrastructure.. I will try the customer service end this week or next week; any advice on how to best approach this so as to not get the run around? So I was reading on the comcast site about DOCSIS 3.0 and that it is necessary to have a modem that supports the protocol. of modems and the modem I have, which i belive is the scientific atlanta DPC2100R2, does not show as supporting DOCSIS 3.0; I subscribe to the BLAST! service. Could it be that I need a new modem? Do I have to get one thru comcast or can I go retail? Is there any pro/con to one or the other? If you want to buy your modem , you can buy from the /comcast store or from most electronics retailers. The drawback is that if you own your modem and it fails you need to pay for the replacement. I get Blast! too, your modem is DOCSIS 2. According to CC Dete DOCSIS 2, will support Blast! speeds. I know the list says it's DOCSIS 3 is required....So if you rent the modem they may or may not swap it for a DOCSIS 3. I am showing the modem is offline currently. Is it uplug at the moment? 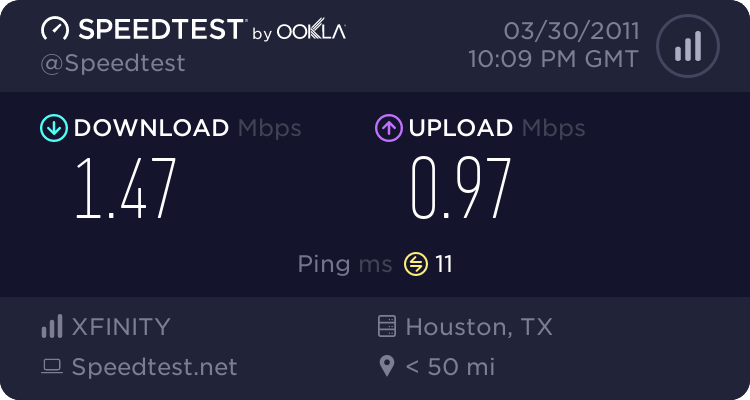 Re: Houston TX Slow Dowload/Upload speed for what I pay for? Yes, I have it with me... was going to take it in to the local Comcast store today after work to trade it in. Spoke with Michelle thru online support yesterday and she said I did need a docsis 3.0 compliant modem. Ok, let see if the new modem is any better. Let us know the progress. exact same test results as the previous modem, regardless of server location; i even did the test thru the comcast site to the comcast server here in houston. Could it be a signal issue? If more info is needed please let me know; I just want to get something close to what I am paying for.